Last Wednesday, I mentioned in our e-newsletter that we had a new game and that I’d be revealing information about it on Facebook, our website, and BoardGameGeek, even though we wouldn’t officially announce the game or accept pre-orders until January 2. The game is Wingspan. In the last 8 days, nearly 1900 people have joined the Facebook group, over 14,000 people have viewed the Wingspan page on our website, and over 28,000 people have viewed the BGG page, where it’s currently been at the top of the hotness for 3 days. How did this happen? Is it too soon for such buzz? Can it be replicated? I’d like to talk about all that and more today. First, some context: I’ve been experimenting with different release methods this year. The latest version of this ongoing experiment was Between Two Castles of Mad King Ludwig, which I announced completely out of the blue in early September. There was a barrage of information, including reviews, pre-orders, and even just the name of the game. It was exciting and fun…but it wasn’t perfect. Distributors and retailers were caught off guard–they weren’t used to a publisher announcing a game that way and actually having the game in stock right away. Many consumers were excited, but my sense is that they felt rushed to learn a lot about the game and make a decision right away. There was no sense of anticipation. Also, while Stonemaier fans knew that something would be revealed that day, they had very different ideas about what it would be (and I don’t think anyone guessed this). After dabbling with a new method for Scythe Encounters, I decided to tweak the formula for Wingspan. Starting on November 28, I simply started to talk about the game on our website and in the Facebook group. I was very clear from the start that pre-orders wouldn’t begin until January 2, and crucial information wouldn’t be revealed until then (MSRP, SKU, retail release date, reviews). Rather, I wanted for there to be a period of time when people were aware of the game and could learn more on an ongoing basis in bite-size pieces. I didn’t have a set schedule; rather, every day in the morning I write a short post in the Facebook group that features photos of a specific element of the game. I talk about what the component is, how it came to be, and its function in the game. 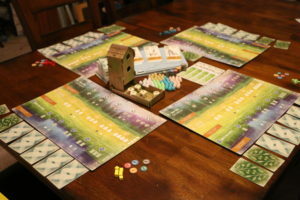 For people who aren’t on Facebook, I then post the same content on the Wingspan page and design diary, and I add the photos to BoardGameGeek as well. I’ve also been posting a few images on Instagram. I must admit that the results have far exceeded my expectations. My surprise stems from experience with other recent releases and the fact that people still only have about half the information about the game. Also, let’s be honest: This is an industry where many of the blockbuster games are fantasy/sci-fi boxes brimming with plastic (nothing wrong with that, but Wingspan is quite different in terms of composition). So why is this happening? Of course, there’s the product itself, but there are plenty of beautiful, well-designed games with creative themes. Heck, there are even other bird-themed games. Also, I think it helps that we already have a critical mass of e-newsletter subscribers to get some early momentum. Anticipation is fun, especially if you’re not 6-12 months away from experiencing the thing you’re anticipating. 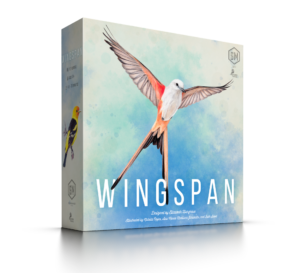 Wingspan is already in our warehouse and will start shipping to Stonemaier Champions as soon as pre-orders open on January 2 (the retail release date will be a few months later to give distributors plenty of time). The daily dose of information has captured the best feelings of stretch goals without the downsides. Every day, people are learning about some new component or element of Wingspan. Because we started with nothing–just a name–every new reveal feels like an addition. “If you enjoy Terraforming Mars and Gizmos, we think this game will take flight at your table.” I actually think this sentence has been instrumental in helping people conceive the potential of Wingspan without knowing everything about the game. Wingspan is a competitive, card-driven, engine-building game, which just so happens match with Terraforming Mars, one of the most successful games of the last few years. This comparison helps to frame the game’s potential. Most of the advance copies of Wingspan went to reviewers. But one of them went to Kim Euker, a professional photographer, which has allowed me to feature much nicer photos of the game than I would otherwise be able to do. It seems like a key to unlocking the hotness on BGG is getting a nice image (ideally of the real game on the table) on the front page, and these photos absolutely helped accomplish that goal. So can this method be replicated with the same success in the future? I think there are far too many variables to say for sure. But I think any creator can do those four things (though the first is tough if you’re using Kickstarter, and the fourth is also tough for Kickstarter creators unless you have a really nice prototype). Is this system perfect? I don’t think there’s such a thing, especially since tastes vary. Some people want to read the rules, but once you know everything, I can no longer reveal things you don’t know, which takes away from the fun. Also, I’m not preventing people from simply ignoring the game until January 2, when they will have all of the information (including the rules and reviews) all in one place. It’s a win-win for both types of people, and my company doesn’t suffer as the result of a game not reaching its visibility potential. There’s also the risk that there’s not enough to keep peoples’ attention for a full month before pre-orders begin, and people may lose interest. I actually don’t plan to continue the reveal every day, as I–as will other people–will be busy with the holidays in a few weeks. But my hunch is that the timing of the reveal fits well into the anticipation window, and it helps significantly that people who pre-order from us will actually get the game in January. So far, I really, really like this system. It’s a hybrid between all the other announcement methods I’ve experimented with this year, and it’s worked so well that I’m eager to try it again in the future. What do you think? Have you enjoyed the Wingspan “soft announcement”? Would you like to see other creators use the same method (or perhaps you’ve already seen that happen)? I love Dominion and the thing I enjoy the most about a new expansion release is that the week before it it is shipped out to retailers, Donald X. Vaccarino does previews of cards and new mechanisms featured in the expansion. Every day, I am going to BGG or the Dominion Strategy Forum to view the pictures and comments about the new cards for the day. It is one of my favorite weeks of the year. Just a lot of fun and exciting. So I hope you will be able to continue a release method like this for future games. I was checking your site every day, and I loved the anticipation of what would be revealed next. I agree, Vaughn–I really like those previews as well (it reminds me a bit of Magic previews). I’m glad we were able to capture a bit of that anticipation for Wingspan! I was very skeptical about all of this: the anticipation-building and then the game itself… but I am liking both of them. My concern was that the anticipation-building would feel contrived but it hasn’t been the case. And that tagline and the initial photo didn’t do much for me (TM is not one I’ve ever wanted to learn)… but I was willing to hear more and I’ve loving what I hear and have been drawn into the visuals. When I was a kid, I was roped into doing a lot of electioneering (my dad worked for the DA and his boss had to win re-election for him to keep his job). I remember one big lesson, at least for local elections was not to tie yourself to other elections at the same time. If person A was considering voting for you, but you also showed support for candidate B who they disliked; it was harder to overcome those negative feelings than it would be to leverage any positive support you for from it. It takes far more positive to overcome a negative. So I too cringed a little because this game sounds like something I would really enjoy, but TM is such s polarizing game (albeit very highly rated) that if my friends get wind (ha!) that wingspan is compared to it, that will make it much harder to get to the table, versus if I said it was a Stonemaier game, that would be an easy pitch. Apple has done stuff like this in the past. They started buy buying the store and completely covering the store front with a black sheet. After days or even weeks the curtain would be pulled back just a bit to reveal a peak at a portion of the apple logo. Over a period of time bit by not theu would release little pieces of information and pull the curtain back a little bit more before finally revealing the release date on social media. A day where they would of course have a big opening with special deals and the latest products. It worked. I think we all like the idea of not knowing and learning more, especially if the brand is already established. Zack: That’s really neat! I like the visual of revealing it little by little. I was somewhat interested in the release method, but it is the game itself that has me hovering over the moon in anticipation. I went straight for the images; and when I saw the bird pictures and feeding tower, the many bird-loving non-gamers I know who will want to know about Wingspan crowded onto my FYI list. The rekease tidbits also piqued my interest in Elizabeth Hargreaves, which in turn led me to discover and preorder Erin Dean’s “For the Love Of Board Games,” which has chapters from Elizabeth, Jamey, and 51 other noteworthy game designers. Only 26 more days until…..! Dorothy: I’m glad to hear that Elizabeth is in that book–she’s an extremely talented designer, and it’s been a pleasure to publish her game and work with her. Yes indeed, but in my comment above I mispelled Elizabeth’s surname, which is HARGRAVE. I personally really enjoyed the surprise of Between Two Castles AND how quickly I was able to get it to the table (as a SM Champion). This roll-out has been a good experience too, though, and I appreciate the MUCH shorter window between the game announcement and the game hitting my table. Think you are really on to something with that. Thanks Josh! I’m curious to see which method resonates better with you and the other Champions after we’ve completed the process for Wingspan. This is like a wonderful little information drip that keeps me interested and coming back for more. Much more manageable to digest smaller parcels of information as I keep returning to the birdfeeder to see what’s new. Love it. Thanks Measha! I’m glad this game has connected with you so far. My plan is to talk about it on Instagram every 3-4 days, as I like to post a variety of stuff there. I do think the slow-drip of information is a great way to build excitement. I mean, it’s a little maddening because, at some point, you’re like “alright, I know enough and I’m completely sold. Now please let me give you my money”, but I do find myself keep coming back to learn more about the game though. It also seems like an incredibly useful way to slowly teach a lot of the rules before anyone even opens a box. I’d love to see you do a similar approach for a future release where you slowly introduce not just the components, but also the rules, in a much more incremental, structured way. I think there’s a good portion of the excitement that is not at all related to the method of disseminating information or the actual product release though. The fact that Wingspan seems to be much more of an engine building game (in comparison to Between Two Castles) means it’s probably getting a good piggyback off of your success with Scythe. I personally didn’t buy Between Two Cities because it didn’t appeal to me as much. Wingspan, on the other hand, has me antsy in anticipation. Your comparison to Terraforming Mars only helped solidify that as well. Also, yes, amazing photos (and obviously amazing artwork!) can take a game to the next level before anyone even knows hardly anything about it. I’ve enjoyed and appreciated it. Kickstarter is tough for me for many reasons I won’t detail here. But this method has been fun and refreshing. It has made me excited to pre-order on the 2nd of January. A big part of that is that I enjoy card driven engine builders for sure, but I can’t help but think that the anticipation factor has played a lot into it. Thanks for the innovation of your games and methods, I enjoy them! I don’t do Facebook, so this Dec 7 post was where I first learned of Wingspan. From there to the Design Diary, where all the birds tweeted loudly at me. I love treasure hunts; but once I see the treasure within reach, I want to grab it right now—especially when I think it will help with something I’m working on. Waiting is for the birds! That would satisfy both those who enjoy prolonged anticipation and those who prefer immediate gratification. And, all the more reason to become a Stonemaier Champion! Thanks for dreaming about Wingspan, Dorothy! I appreciate you sharing your idea. Champions actually always have their orders shipped right away–that’s part of what they’re paying for. We often also offer them an additional discount during the pre-order window. As for charity, I’m reaching out to a few bird-centric non-profits, and it’s possible that some of the arrangements we work out with them will end up benefiting their charities. But that will be separate from the average person who just wants to pre-order a game. I, too, have enjoyed this release strategy. I’m newish to the hobby and am already getting burned out on the Kickstarter release window being 8-18 months (Spirit Island) in the future. Is there any comparison to Everdell? I enjoy Everdell for the card building, art, and the appearance. That was my first thought, especially with the 3D construction both games have. Thanks Jeff! While Wingspan shares some cute woodland creatures with Everdell, otherwise the mechansims are pretty different. Wingspan is primarily an engine-building game. Though both games do feature a lot of unique cards–they have that in common too. Personally, I won’t even start evaluating a game until all gameplay information is known (including a rulebook). 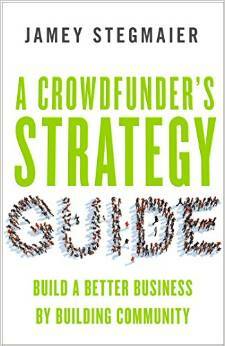 I back a lot of Kickstarters, but back out of at least half, and that’s the reason for most. I’m actually not remotely into hype and hotness. I typically won’t buy a retail release until after either I’ve played it, had a personal recommendation from someone knowing my tastes, or occasionally; after I’ve read so many reviews (never videos btw) that I’m sure it’s for me. I tend to pick non-KS games up within a few years of release, not days. KS games I only commit to with a rulebook, and a significant value proposition compared to OLGS (which almost always means KS Exclusives – KS pricing is normally worse than post-release online, let alone significantly better). Once I do choose to buy a game though (and presuming I like it when played), I’ll buy all expansions on release (in fact usally preordered), even with minimal information, and hardly ever any regrets (truly only 1 game I can think of). So, for me, this method has no gain, but also no loss compared releasing all info with the game. Releasing all the info X months prior to release, would have me looking into it and considering it X months earlier however. It might get a release day sale from me (probably not, but sometimes), but would certainly get an earlier sale if it will get one at all. the main reason so many of us were excited is that it’s a Stonemaier game. I do not buy each and every Stonemaier game but I know you put effort in it. By far the best release ever for a boardgame. I stopped backing on KS because delays and underdeveloped games killed my enthusiasm. Plus, by the time a year and half has gone by I have different tastes then when the KS first launched. Even most preorders I have to wait months before launch. Here, I can be a champion and get my game in a week or 2. You get the slow reveal and excitement but still get the game without waiting! I love it! Another reason Stonemaier is one of my favorite publishers.